I have 3 kids who love being outdoors. They've all gone to summer camp, and would live there if they could, and my middle child enjoys backpacking. Each of them is involved in sports as well, and the benefits of these activities go far beyond those of health and exercise. In addition to cultivating a love and respect for the outdoors, they've also had opportunities for leadership through sports teams and leading younger campers. They've been exposed to different careers from athletics, coaching and youth leadership to outdoor sciences. As a matter of fact, Busy Boy (age 14) is seriously considering a career in Wildlife and Fisheries science that was sparked from his experiences at camp and being outdoors. Also though these activities, all three have learned self-reliance that's translated into maturity, particularly in the classroom at school, and we all know that being able to release excess energy outside is an important way to help kids get ready to learn. We are very lucky to have the resources in our community to make this all possible. There are parks, sports facilities, camps and even back yards ready for play that have provided my kids with skills and memories to last a lifetime. But, not everyone is as fortunate as we are, so Sprite has started the Spark Parks Project, an ongoing effort to refresh parks, playgrounds and active spaces across the nation. Beginning April 1, 2011, Sprite is partnering with Habitat for Humanity. 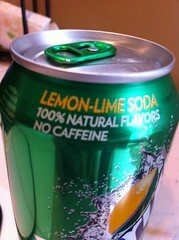 Look for specially marked Sprite and Sprite Zero cans with green tabs and collect them. 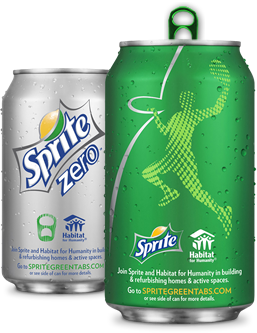 For each green tab from Sprite or Sprite Zero received by 6/30/11, Sprite will donate 10¢ per tab up to $500,000 (with a minimum donation of $250,000) to Habitat for Humanity. We've started collecting them, and since Sprite is big around here, the kids are excited to see how many they can collect! But, hurry, the tabs must be received by June 30, 2011. Why not do something fun while you're collecting green tabs? It's always nice to have some pictures of your family activities and $100 from Shutterfly would go a long way in documenting your memories. You can even take pictures with your Sprite Tabs for Habitat you've collected! b) Tweet about this promotion (I'm @busymom) and leave the URL to that tweet in a comment on this post. 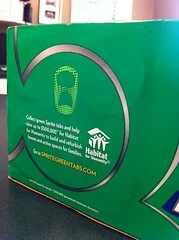 e. Upload a photo of your personal green tabs collection on the sweepstakes main page at http://www.blogher.com/sprite-tabs-habitat. Be sure to leave a comment here telling me you did it! 4. Contest ends 5:00 p.m. (PST) May 31, 2011. 5. Winners will be selected via random draw, and will be notified by e-mail. Don't forget to visit the Promotions & Prizes page for even more chances to win! (I have some other giveaways going on, too! Enter to win a $50 gas card and enter to win 1 of 5 full-value Sara Lee dessert coupons). I wrote this post while participating in the Sprite Tabs/BlogHer program on behalf of Sprite. I received the product to facilitate my post and monetary compensation for the time to write my post. I just bought bicycles for my whole family. We are going to bike around everywhere this summer. We plan to go to the pool a lot. My kids love for me to play outside with them so that's what we do as long as the weather permits! Lots of bike riding, boys' and girls' scout camps and maybe a trip to Grandma & Grandpa's to keep busy with the cousins! I plan on keeping my family busy by going on trips! I also want to get my son interested in volunteering this year when he's not busy working!!!! We're planning on camping, VBS, and swimming lessons. My kids do swim team and we train together for running events and family triathlons. We're going to do regular Wii Just Dance 2 parties! We like to keep in motion by doing volunteering and playing outside games! We have an above groud pool and spend most of the summer swimming. We also like to go bike riding and for walks during the late afternoon. When it rains, we usually go bowling or walk in the mall. We farm, so staying busy outdoors is just a given. For us, lots and lots of backyard and pool time! We're hoping to open our pool around Memorial Day weekend [crosses fingers] if the weather holds out and it doesn't snow, or something, weird right? Swimming lessons and the back yard play set with a side of bikes in the cul de sac. We will bike, walk, go to the pool. My son will also go to a sports day camp. We've also moving - does moving furniture and unpacking boxes count? LOTs of swimming and dog walking! swimming and dog walking/hiking are the top of my list. i have bike on my list for this fall (post baby) since my current bike is circa 8th grade in 1995!! Two of the four kids play competitive soccer which never really goes on hiatus, just slows down slightly. Time at the fields gives the rest of us a chance to run around and be goofy. We also live ten minutes from the beach where we spend a few days a week over the summer. Add in bike rides, swimming, summer camps and impromptu neighborhood games of whatever and we are rarely still!! summer is our time. We go camping, we spend time in the park, swimming in the lake and so much more. I can't wait for summer to get here. I don't have kids of my own, but as a youth director, I love to plan things that get the kids outside and moving. We do everything from Watermelon Olympics to hikes and flag football. Swim lessons!! Also, I'm sure there will be plenty of beach or mountain days when we look for a change in location to beat the heat! We will be staying at my father-in-law's lake house and enjoying all types of water sports! My kids are little (2 and 4 1/2) so it's not a problem keeping them in motion! We have a lot of old-fashioned backyard play. We've also discovered that if it's storming or too hot to play outside, playing with a beach ball inside is lots of fun! I've bought a deal for half off trips to the indoor playground. I think it will really come in handy when we need some activity but it's oppressively hot outside! We have bikes and skates and skateboards. I just stocked up on bubbles and chalk. I have 1 that will go for a few weeks to summer camp. We redid our backyard last week and added a kiddie pool for the babies and a bigger pool for the older kids. We plan on visiting the beach often, we already started that and we do a beach clean up each time we are there. Roadtrips are a must for us, during the summer and all year! We are planning a few both in and out of the state! We have annual passes to the zoo and to Busch Gardens & Sea World so we will be visiting there as well. :) cant wait for summer!! I want to get a bunch of sports stuff for outside games...like a volleyball net, etc. We already play soccer together pretty often. We'll be hiking, bowling, volunteering, and taking a few road trips to visit family. We will go for walks/hikes and probably do lots of swimming. Lots of plans to volunteer this summer! We love swimming and water skiing! Kids are water rats. So it is swimming lessons, diving lessons. swim team partice. swim competitions. I have 6 so it is alot of water and sun screen. My family will be in motion all summer working on our family farm. We will keep active this summer by swimming and biking. my family loves to spend time outdoors. we love going to the park, spending time at the beach, camping in the mountains, and getting out there and volunteering. Play is very important to our family...we especially love the warmer weather when we can picnic and hike the peaks around our area. It really brings us very close as a family. We are having a baby this summer, and offically kicking our family into gear! Yay! Thank you for the lovely giveaway. I plan on walking lots and lots around the neighborhood! Good chance to get to know my neighbors. As long as the weather allows my granddaughter will swim daily. Play is important---I think that active kids grow up to be active adults --kids that are used to walking, biking, running, hiking, and playing sports will be less likely to turn into couch potatos! If you have a lake nearby, I recommend taking the family there for outdoor activity. The options are endless and everyone has a really good time. We do it every summer and it's wonderful after being cooped up for so long from winter. I have hard wood floor so this would be perfect for me! Thanks for the great giveaway! W will be going to the pool, a lot, and plenty of bike rides. We wake up early and are very active in the morning, then it's indoors to read and then back out when the sun isn't so harsh. we enjoy spending time at the lake! Every children feel entertainment in playground place for playground equipment.